Today's Image of Mars is a perspective view of Echus Chasma as taken by the High Resolution Stereo Camera (HRSC) aboard Mars Express. Located in Lunae Planum and measuring 100km long and 10km wide, Echus Chasma is one of the largest sources of water on Mars. 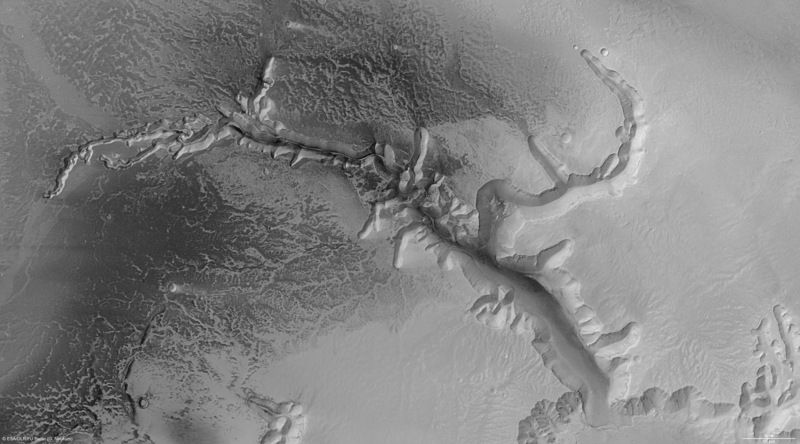 The 4000m deep trough is thought to be the source for water that carved Kasei Valles, a 1780 km (1100 mi) long set of flood carved channels on Mars.